Generally speaking, homeowners don’t replace their windows unless absolutely necessary. For instance, if a severe storm hits the area and breaks a few windows, they might look into repairs. On the other hand, some homeowners opt for replacement windows to update the style of their home. New windows can increase property values, improve energy efficiency, and provide natural sunlight in more rooms throughout the home. Whichever camp you find yourself in today, you’ll want to know the total cost of energy efficient windows in DFW. Like any other type of window available to homeowners in the area, energy-efficient windows range in price. 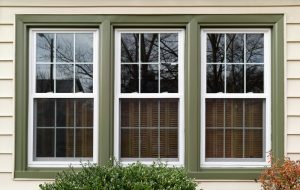 Typically, Energy-Star qualified windows begin at $120 for a 36-inch-by-72-inch, single-hung window. The price can quickly rise to ten times that amount, though. With installation, you’re looking at a few hundred dollars per window. The lower the cost, the lower the energy efficiency. A cheap window is not worth the investment, as you won’t see any returns on your energy bill. With double-pane windows, you can save up to 15 percent a year on your monthly energy bill. Of course, the energy savings you experience can vary from home to home. It all depends on climate, local energy costs, and the type of window you choose to install. When you are shopping for energy efficient windows, you’ll likely stumble across a few different types or added features that will make a big difference. For most homeowners, these features are nothing more than a buzzword. However, do not ignore terms such as “glazing” or “low-e,” as both offer advantages towards your home’s energy efficiency. Glazing – Glazing refers to the type of glass used in the window itself. You may have noticed that some windows are marketed as “double pane.” This essentially means there are two layers of glazing involved. Glazing can affect a window’s U-factor, or how insulated it is against the weather. Low-E – Low-E stands for “low emissivity,” which is your window’s ability to reflect heat rather than absorb the sun’s rays. A thin metallic substance is coated over the window, but the process does add to the overall price. Spacers – A space is a thin sheet of glass that is separate from the actual window. It is used to improve insulation while preventing heat loss and excess condensation from accumulating in the window. As you can see, replacing your old windows for energy efficient windows in DFW is a large investment. It’s the type of renovation project that many homeowners tackle just once in their lives. If you have saved up the funds and hope for long-term returns via energy efficiency, then new windows may be the right path for your home. Here at Starwood Distributors, we provide homeowners in DFW with window treatments and new window installation. Our affordable, high-quality services are sure to leave you satisfied with your home. Give us a call at (214) 718-7304!